“How suddenly the morning comes in spring! As Meng Haoran described in his well-known poetry “Spring morning”,the brooch present us the exactly same scenery. 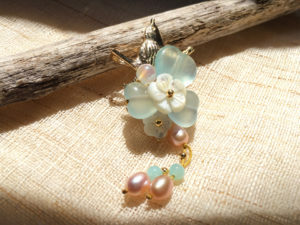 The brooch is mainly made of light blue jade and shell-flowers, with pearl pendant and cloisonné as a foil.Elegant and graceful design which is very suitable for the gentle spring.